Following the Air Vice Marshal Musibahu Soladoye’s retirement from the Service, Air Vice Marshal Isyaku Bukar has taken over the mantle of leadership as the 23rd Commandant of the Air Force Institute of Technology (AFIT), based in Kaduna. 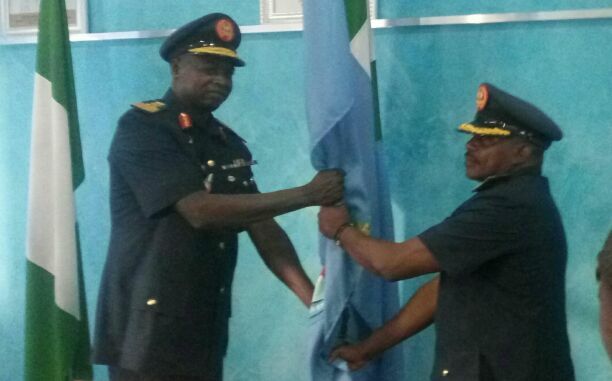 Speaking during handing and taking over ceremony at the institute’s headquarters in Kaduna on Thursday, the outgoing commandant said, the institute has achieved various milestones since he took over as commandant on the 7th August, 2015, as evident in passage of the AFIT enactment bill by the National Assembly and the registration of over 65 engineering officers with Council for the Regulation of Engineering in Nigerian (COREN). Aside from its obligatory mandate of logistics personnel training, AVM Soladoye said that, the institute is involved in vigorous research and development activities in diverse areas of aircraft and aerospace ground equipment development. He then appreciated the Institute’s personnel for their assistance when he was commandant and we implored them to extend the same gesture the incoming commandant. In a remarks, AVM Bukar said, a training institution cannot be static, but has to be dynamic in order to move the Air Force and the country security forward. “We have to keep pace with all the challenges bedeviling the country because training institutions are what maintain and provide the personnel that carry out all the duties within the Service. The best we can do is to add value to whatever we meet so that those that will come after us do the same”, he said. AVM Isyaku Bukar, a graduate of Electrical and Electronics Engineering from Ahmadu Bello University (ABU), Zaria, was the pioneer Head, Department of Aircraft Engineering AFIT and Director, Air Engineering, Headquarters, Nigerian Air Force until his appointment as 23rd AFIT Commandant.